A Schuler 850nm Infrared pass filter was fitted to a DMK 21AU04.AS camera, which was placed at the prime focus of an f/5.5, 80mm, ED refractor. The Raspberry Pi computer was powered by a 3 Amp power supply which eliminated under-voltage warnings previously seen when using a 1 Amp supply. The Pi is mounted on the back of the monitor. 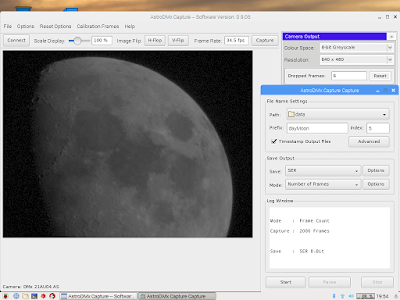 Sustaining about 34fps, 2000 frame SER files were captured of two overlapping halves of the Moon. Processing of the data was done on a Linux Mint computer as all of the the appropriate software has not yet been ported to the Pi (work in hand). The best 80% of frames in the SER files were stacked in Autostakkert! 2.6 running in Wine. The two resulting images were stitched together using Microsoft ICE running in Wine, wavelet processed in Registax 5.1 in Wine and post processed in the Gimp 2.9.